A rising R&B/pop singer in Australia currently making her first inroads in the U.S., Senani (www.senani.com) engages in a beautiful fantasy in the colorful video for her infectious new single “Free”—perfectly capturing the sensual, liberating and gently exotic spirit of her music. As tablas and other instruments from the region of her native Sri Lanka jangle in the intro and throughout the song, in the music video for Free, she is seen in business attire, working, frantic, on a laptop. Falling into a day dream, the hip and edgy, funky/soul vibe kicks in as she drives along the majestic Great Ocean Road south of Melbourne toward the beach, where she dances on the sand, plays in the waves, and basks in the sunshine. Changing hair color (dig the bright red! ), wardrobe changes and a few flashes of her in a jungle setting are all part of the magic as she asks the lover she imagines to take her hand and fly across the crystal sea…“on the way to the light, where freedom is calling me.” Making the theme more universal, she later sings, “Freedom in life is where you want to be” –and Senani’s soaring wordless vocal after singing the title says it all about her desire to transcend. This colorful dreamscape is an apt metaphor for the surreal way the multi-talented performer’s career has exploded over the past few years. All of the groundwork and the success of Senani’s individual tracks are culminating in the upcoming release of a “six pack” of singles which will later be included in her highly anticipated debut album Infinity. After previewing the album at two prominent Sydney jazz and soul venues, Blue Beat and The Basement, she took Charlie Fox from 96.1FM, a prominent local radio programmer’s advice and set her sights stateside to take her career to the next level. 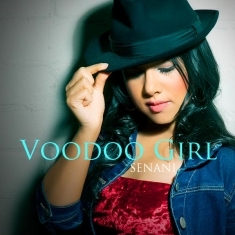 Senani has spent weeks at a time making contacts and performing in two of the U.S.’s most prominent music cities, Nashville and Austin. In June 2013, she spent an amazing week in Music City, meeting industry people, musicians and songwriters—and showcased at several songwriter performance nights at such venues as The Blue Bird. Heading to Austin later in the summer, she immediately hooked up with a musician who gave her a list of all the musicians in town who could help her put a band together. Working in a duo setting, she booked gigs at the Triple Crown in nearby San Marcos, B.D. Riley’s Irish Pub on 6th Street and The Elephant Room. She has also participated in some of the city’s songwriting nights as well. If Nashville seems like an unusual destination for a Sri Lankan born, Australian bred soul singer to explore her career options, it’s all because of…country superstar duo Big & Rich – and a psychic. While emphasizing natural medicine, Senani has created a holistic practice emphasizing nutrition and diet; one of her trademarks is analyzing her patients’ digestive histories to find ways to prevent and heal related illnesses. Like many professionals who focus on holistic medicine, many patients come to her after exhausting traditional medical treatments. Rather than simply accepting the idea that we must wait until a condition is diagnosed and then treat with either a drug or surgery, she analyzes underlying factors of her patients’ conditions with the goal of correcting the imbalances that lead to illness and preventing disease. Trying to minimize the use of prescription medication, Senani’s patients use anti-oxidants, diet supplements and vitamins. Believing that the mind contributes to up to 50 percent of people’s health problems, she also focuses on healing illnesses by looking at stress, depression and anxiety.